In the Business Model Canvas, the relation between the Value Proposition (actually Customer Value) and the Customer Segments is very weak. Neither the "what" nor the "why" questions are properly answered. From the Business Model Canvas we take the Customer Segments field and use it to portray the customer perspective. We define the Customer Groups and define their desires and anxieties. We take the Value Proposition field and use it to portray the Value Proposition and define the features, benefits and user experience for our service or product. The Function in Abell tells you "why" your customers are going to buy from you and not from your competitors. Its hard to figure out the "hidden" needs, wants and anxieties, so you need to check your assumptions by checking "why" your customers have placed an order with you or "why" they have decided not to buy from you or not to buy al all. Always do the Abell Analysis and revisit it every day! It has proven to be my most powerful strategy tool. Step 3: Osterwalder adds the Value Map and Customer Value Canvas to his Business Model Canvas. 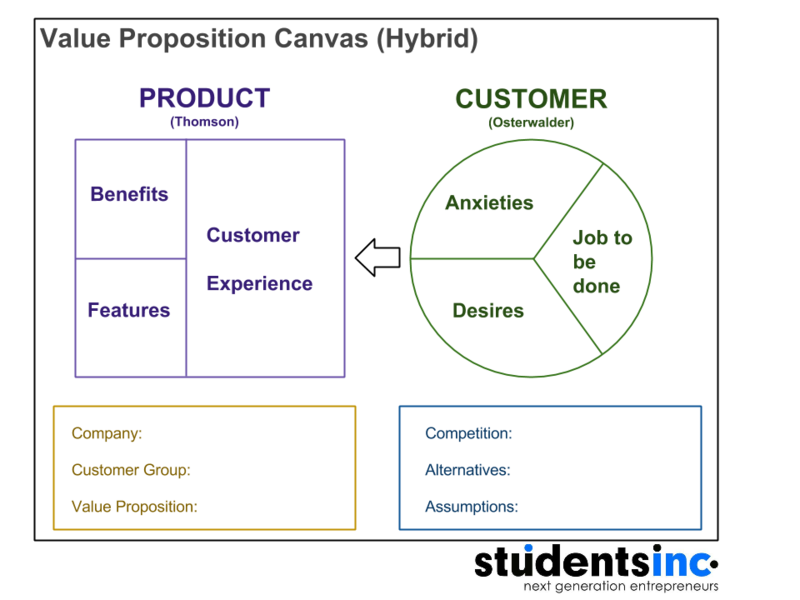 In January 2010, Alexander Osterwalder proposes an add-on for his Business Model Canvas, to strengthen the relation between Value Proposition and Customer Segments. He calls it the Value Map or the Customer Value Canvas. The product proposition side isn’t grounded enough in marketing, copywriting and persuasion techniques. It doesn’t guide the user into creative thinking and honest self-evaluation. The customer side isn’t grounded enough in behavioural psychology or customer behaviour research. It doesn’t guide the user into deep empathy for their customers or draw out enough new insights. He has created a canvas to guide startups into examining the human experience of their customers. This canvas contains questions and sections that manoeuvre users of the canvas into thinking through the customer experience. The customer side (always start on the customer side) Want, needs and fears, replace Jobs to be done, pains and gains. This is not strait translation, its just a different way of looking at the matter. Same goes for the product side whereby Product/services, Pain Relievers and Gain Creators are replaced by Features, Benefits en the User Experience. To me this model makes more sense than Osterwalders, but you can use either model. Read Peter J. Thomson's Article! Step 5: Nils de Witte adjusts terms a bit and re-introduce "Job to be Done"
In the end it all comes together.